Courses are offered during the fall, spring and summer semesters, but students can start the OMBA only in the fall or spring. The fall term begins in August and the spring term begins in December. If students choose to take a break, they can resume their studies the following semester. The program can be completed in just 21 months. The USC Marshall Online MBA is a 51-credit program, offering an integrated curriculum comprising a residential intensive and five required cross-disciplinary courses. In each course, students acquire essential knowledge about the corresponding core subject areas—marketing, finance, management, accounting, entrepreneurship, and more—and gain a holistic understanding of how these disciplines fit together in an organization. The program begins with The Role of the Manager, a two-week course that includes a six-day residential intensive component. While on campus, students engage in team-building activities including a competition that requires them to analyze and make recommendations to solve a business problem of a prominent company or organization. The five remaining courses are fully online, each spanning 15 weeks. They are the Fundamentals of Business, Opportunity Recognition and Implementation, Managing Inside the Firm, Managing Outside the Firm, and Business Environment and Leadership. This advanced integrated curriculum is the cornerstone of the Marshall Online MBA and supports our primary goal of developing students into leaders ready to succeed in the global marketplace. These online courses consist of award-winning asynchronous and synchronous coursework. Asynchronous activities include video presentations, moderated discussion boards, and a range of other virtual learning experiences. Synchronous coursework consists of an array of real-time interactions including live online class sessions, collaborative virtual activities, and one-on-one meetings with faculty. A defining element of the Marshall Online MBA is its use of a full range of technological learning tools to create an engaging online learning experience and provide students with practical skills, such as virtual collaboration, that apply to today’s global, digitally-driven business environments. Live online class meetings take place two to three times per week, on any day of the week, and last between one and two hours. The schedule accommodates working professionals and varies each semester. The average student GPA is 3.17 and the average GMAT and GRE scores are, respectively, 618 and 309. The average age of students is 34 years, and they have an average of nine years’ work experience upon entering the program. Female students make up 35 percent of the typical class. The Marshall Online MBA employs an individualized, consultative approach to career services, recognizing that online learners have unique, professional backgrounds, life circumstances, and career goals. These services include one-on-one career advising and resume and cover letter reviews. Students also have full access to a range of other Marshall residential program and dedicated online program career resources, including extensive Trojan Family networking opportunities. The approximate overall cost of the program is $98,000. It covers tuition, textbooks and course materials, and the one-week on-campus session including lodging. It does not include meals, travel to and from the USC campus, or student health insurance (which may be waived). Marshall offers a limited number of scholarships to students in the Online MBA program. Additionally, many employers participate in tuition assistance programs and there are several loan options available for students. Three types of loans are available to finance the OMBA—Federal Stafford Loans, Federal Direct Graduate PLUS Loans and private student loans. It is recommended that U.S. citizens or permanent residents apply for Federal Stafford Loans first, because they offer favorable interest rates and origination fees. International students are not eligible for this loan program. Applicants to USC Marshall Online MBA program must have a four-year undergraduate degree or equivalent. At least two years of professional work experience is desired. Applicants must submit a completed application form, all college transcripts from degree-granting and non-degree-granting institutions, a current résumé, and three letters of recommendation, with at least one being written by a professional contact. The school also requires applicants to complete an essay about their leadership experiences and goals, and provides them with the opportunity to submit five additional documents to convey other relevant information to the Admissions Committee. The Committee will invite some applicants to interview via web conference. GMAT or GRE scores (GMAT is preferred) and a nonrefundable $155 application fee also are required. A few applicants may be granted a GMAT waiver. More information on GMAT waiver requirements can be provided by an enrollment counselor. International applicants may need to submit TOEFL or IELTS scores. 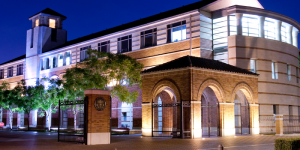 Interested in learning about the USC Online MBA? 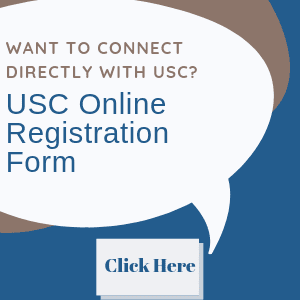 Fill out this form and someone from the USC Online MBA team will reach out to you shortly!